Upon entering the auditorium in the Gelsey Kirkland Arts Center, the audience is met with a larger-than-life projection screen. Its big size makes a big impact–as does its light color amidst the rest of the stage, which seems shallow and dark. 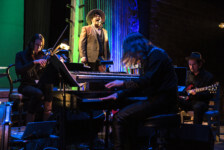 But there are hidden depths to that stage and they surprise throughout Acquanetta, an opera inspired by a 1940s actress of the same name who kept much of herself hidden, too. For the opening aria of the opera, which was written by Deborah Artman, composed by Michael Gordon, and directed with bravura by Daniel Fish, the projection screen shows an intensely zoomed-in shot of the eyes of the actress playing Acquanetta (a mesmerizing Mikaela Bennett). It stays there for quite some time, to the extent that it verges on the grotesque, and it’s unclear where the actress is and where the orchestra is, too. It’s unclear, even, if the image being shown is live or pre-recorded. 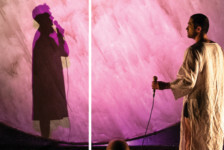 Over the course of the aria, the focus pulls out to show more of Acquanetta, and as the scenes progress it shows other characters, too: a horror film director and other horror film actors swirl around Acquanetta as she remains surprisingly still–or is Acquanetta being swirled around as a camera tracks her to create the illusion of the energy of a film set behind her? The focus pulls out much further, for just a moment, to reveal a bit of the magic as to how these images are being made (and yes, it seems they are being made live). But there remains much to be revealed. 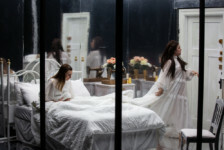 This question of what the audience is seeing is constant throughout Acquanetta, and the question of what Acquanetta is seeing is constant, too. The focus remains largely on her for the opera’s seventy minutes, as she stares out intently at the camera recording her and seems to register fear at what she’s being subjected to on the Hollywood film set. Gordon’s score matches a B-film’s campy horror and Artman’s lyrics belie a real horror at how Acquanetta–and all women–are treated in Hollywood. Midway through, the director tells Acquanetta, “don’t say a word. 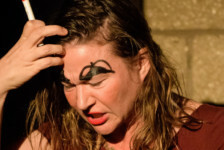 It’s all in your eyes.” It’s true–all of it registers in Acquanetta’s eyes, and the eyes of the many talented female performers in Acquanetta: the misogyny, the stereotypes, the sometimes-brutal manipulation, and the lack of a chance to play a real woman.